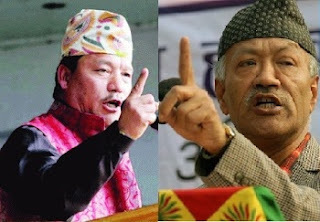 After a bitter and hard fought-Assembly election, the Gorkha Janmukti Morcha and its rival, Jana Andolan Party, are now busy protecting their support base and are on the path of agitation in the hills less than a month after the poll. Four days after the poll results were announced, the JAP started a relay hunger strike at Tricone Park in Kalimpong from May 23 demanding streamlining of water distribution system in town. The party has threatened to intensify the protest if the problem is not resolved by the public health engineering under the GTA and the residents are not given water on a regular basis. "We are likely to continue the dharna for some more time since the administration has done precious little to resolve the problem," said Nayan Pradhan, JAP secretary. The JAP is at present holding meetings at block and village levels to chalk out its future programmes. The Morcha, too, has decided to launch an agitation to demand land rights to people living in tea gardens and cinchona plantations and tribal status for 11 hill communities. Suraj Subba, the general secretary of the Janmukti Parcha-Patta Sangharsh Committee, said: "We have decided to hold gate meetings in front of all 87 tea gardens in the hills and in the cinchona plantations on June 13 for an hour before the start work. This is the start of our agitation and we will vigorously pursue our demand." The Morcha's youth wing, the Gorkha Janmukti Yuva Morcha, has also decided to hold a rally in Darjeeling on June 2 to seek tribal status for 11 hill communities.